Simple & Sincere: Happy Dirtday! We have another great sketch for you to play with this week at Freshly Made Sketches! 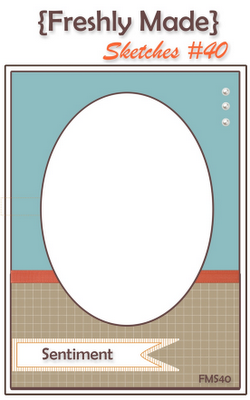 I love that wide open space with the oval, just crying out to be filled with a stamped image and embellishments. I decided to flip the sketch and worked up a cutie-patootie birthday card using the I Dig You stamp set. Fun, don't you think? I hope that you get a chance to play along this week. 'Bye for now! This is so darned cute! Who knew dump trucks could be so adorable?? Oh my gosh! That is so cute! And I love how you turned the sketch. That truck is so cute - love your touches - brads on the wheels and the popped up dirt. What a great card for a little boy! Lovin' that you flipped the sketch to create this super adorable card!!! Great fun colours too! I LOVE dirt-day!! I got the set even though my boys are in the surly teen stage but I haven't used it...you have inspired me to pull it out (and I may have to CASE). This is a super card Jen ... love the chevron bakcground and the red rik rak ... but that dump truck is awesome! Absolutely adorable, Jen! The brads on the wheels are the perfect touch! The colors and the new zigzag are fantastic with this fun set! I just love what you have done here...perfect little boy card! I love how you used the sketch to create this fun card! Great texture and dimension, too!